N00b Squad - "I know sushi"
Normally I am not sorry for comic delays but this one took so long to make we had to mark it down in the history books. Went to Disneyland for a vacation; comic may have been meant for beforehand. I’m seriously considering drawing stickmen at this point. 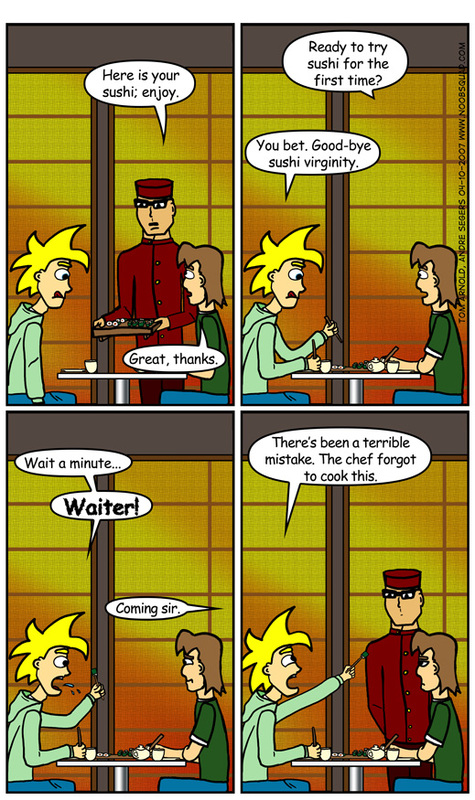 This comic goes way back to when Andre tried sushi for the first, and last, time. I wouldn’t be surprised if more food left his body that evening than the amount that entered it. He plays it safe now and sticks to steak, burgers and pizza for every meal. The game I played the most on vacation ended up not being God of War 2, Jetpac Refueled, Excite Truck or Gears of War. Though all those games were played, the one we played the most was Tanks from Wii Play with Wii Play Laser Hockey a distant second. Wii Tanks looks simple on the outside with 2D gameplay with no scrolling, toy tanks, wooden blocks and nutcracker music but don’t let that deceive you. What lies within is battle after battle with stronger and stronger foes that will challenge your mental faculties. Many times I lay witness to an AI tank dodging a wave of ricocheting bullets leading to a tense one-on-one match of tentative hide and shoot tactics. There’s somewhere around 100 levels and death means game over. We would always aim to reach the coveted level 14 but in the end our patience levels would wane and we would shoot each other in co-op. Here's part 12 of Andre's marvelous Mario RPG saga. And in retrospect, I drew a bell hop instead of a waiter in the comic. I blame it on riding the Tower of Terror at Disneyland one too many times.